The 7” LCD touch-screen* shows more than just route guidance. The navigation system’s LIVE Services also provide up-to-date traffic information, speed camera alerts, weather and points of interest. Thanks to Apple CarPlay** and Android Auto**, your compatible smartphone can also be perfectly integrated. 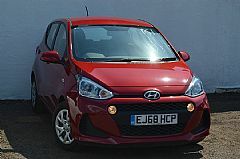 If you want to buy an i10 and you live in Ilford, Romford, Walthamstow, Leyton, Leytonstone or Woodford in London or Loughton, Chigwell, Buckhurst Hill or Epping in Essex or even Enfield in Middlesex, Allen Briggs is your local Hyundai dealer. Premium models can safely hold your compatible smartphone in the perfect location for navigating or playing your favourite music while also charging the battery, all cable free.